The elbow is a hinge joint made up of 3 bones - humerus, radius and ulna. The bones are held together by ligaments to provide stability to the joint. Muscles and tendons move the bones around each other and help in performing various activities. Tennis elbow/golfer's elbow: Tennis elbow is the inflammation of muscles on the outside of the elbow whereas tendinitis on the inner side of the elbow is golfer's elbow. 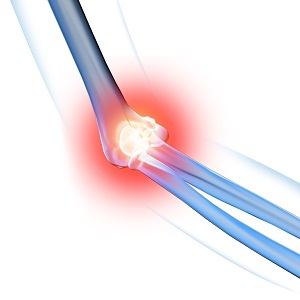 Overuse of the arms or a traumatic blow to the hand may cause tennis elbow or golfer's elbow. These injuries may cause severe pain and tenderness of the affected muscles that radiate down into the forearm, particularly with use of the hand and wrist. Adequate rest and immobility of the affected part helps the muscles to recover and modification of the activities helps in better healing. Heat therapy, followed by a stretching and strengthening exercises, and then ice massage may offer be beneficial. A tennis elbow strap may relieve the pressure from the muscle attachment. Pain medications may be recommended to relieve the pain and inflammation.